Evelyn Schlag was born and raised in Waidhofen an der Ybbs in Lower Austria. 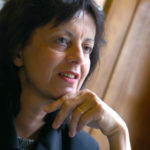 She studied German and English literature at the University of Vienna, and taught in Vienna for a time before returning to Waidhofen, where she divides her time between teaching and writing. She has written seven volumes of prose fiction, a book of essays, and five collections of her own poetry.